Colchester as a garrison town has always been a busy station with most main line services between London and Norwich stopping here. Plus there is the junction with the branch line off to Clacton and Walton-on-Naze which keeps the station busy. Colchester station is unusual in that the up platform is split in two. Main line trains stop at the north end of the station then the track moves away from the platform before going next to it again at the far south end of the up platform. The train leaves on time from platform 5 and straight away a ticket collector is on the scene checking tickets. We stay on the south side of the main line and almost immediately pass an incoming train taking up our vacant platform. There is another track to the north of the main line, which passes under it and joins up with our line. For my outward journey I have taken the slow stopping train direct to Walton-on-Naze - That is what the ticket and timetable says, but the town is known better as Walton-on-The-Naze. This route takes us back into the centre of Colchester, to Colchester Town station (formerly known as St Botolphs). We cross a busy level crossing before passing a set of allotments to the north of the track, whilst on the south side there is lots of wasteland which were formerly carriage sidings. Whilst the track stays double there is just the one platform at Colchester Town. St Botolphs church can bee seen just outside the station. About ten people get off whilst the same number get on, but the train looks pretty empty. As it's a terminus, the driver walks down the platform to the other end of the train and we pull out the way we have come. We go through Colne Junction and rejoin the branch from the main line and soon come to Hythe station that is still in the town area of Colchester. It's urban situation means that the original station building is covered in graffiti and looks semi-derelict in parts. Just one person gets on. The train speeds up to about 40 mph as we leave the town of Colchester behind. On the left you can see several high-rise tower blocks, which are the halls of residence for Essex University. On the right we run parallel to the river Colne in open countryside, though just before we reach Wivenhoe station the trackside becomes more wooded. Wivenhoe is a much nicer station and is quite busy this morning. The scenery now changes to open countryside with ploughed fields and the occasional village before we reach Alresford. There is lots of new housing surrounding the station, which has a modern platform and is again well maintained. We now pass through three or four level crossings in quick succession. This part of the line is very pleasant and in no time we arrive at Great Bentley station, which has many flowers in bloom in hanging baskets. Soon after Great Bentley we pass under the main A132 trunk road and then there's a large scrap yard on the left as we pull into Weeley station. It has two old buildings on each platform but once again graffiti and vandalism are noticeable. Weeley is perhaps most famous for the pop festival, which took place here in 1972, which was the first to be marred by violence. As we leave Weeley the scenery becomes more hilly. On the right hand side on a hilltop is a strange looking contraption a bit like a UFO, perhaps some sort of farm machinery. Next we come into Thorpe-le-Soken (pronounced "lee") station that is the junction station where the line splits for Clacton or Walton. It is still a busy station with a manned ticket office and an island platform. One has worked the trains so that the slow Walton trains stop first and waits for the fast Clacton train. This means that you can get to Walton much quicker from Colchester if you change here. Or if you're going to Colchester you can get off a slow Walton train onto a fast train from Clacton to save time. The Clacton train comes in after we have arrived, but leaves first. I stay on the Walton train, which waits here for around five minutes, before leaving soon after the departure of the Clacton train. About a mile after the station the track divides and becomes single for the rest of the way to Walton. The clickety-click of the line is noticeable, as welded rails have not been laid down for this section of the line. The next station is Kirby Cross, which has a crossing loop. It is an unmanned station so once again the station buildings are boarded up. There are plenty of newish looking bungalows on both sides of the track here and soon we are at Frinton, which is a popular retirement resort. 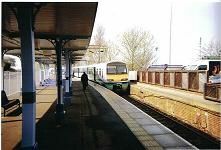 Frinton station has two platforms but no track on the north side. There is a nice mural on this side showing different characters such as Winston Churchill, James Bond and a man with no head! There are also lots of flowers in boxes, which add to the ambiance of this station, which is manned. Not much further along we come to the end of the line and Walton-on-the Naze station. We arrive on time and about 15 passengers get off the train. There is just one platform here and the building is a modern one. The original station building outside the present station has been sold for private housing. There is a turn around of about five minutes before the 11.45 train departs. I get off at Thorpe-le-Soken and there is about a half hour wait before I can catch my connection to Clacton. I walk out of the station hoping to visit a pub, which the ordinance survey maps shows, but the map is out of date and the pub is all boarded up. The village of Thorpe-le-Soken is actually about a half mile to the north of the station, so I saunter back to TLS station and wait with two other passengers for my train. There are no freight trains on this line so it is a very sleepy station when there are no trains. To the north of the station is a large building, an old factory that is now derelict, which is a pity. The station car park is full though, showing that plenty of commuters do use this line. London is just 90 minutes away. A scene that happened an hour earlier is now repeated with the slow Walton train coming into one platform, followed soon after by the fast Clacton train, which I get on. It is now non-stop to Clacton, signs of which appear soon after we leave the Walton branch. First there is a caravan park, followed by houses and an industrial estate. Clacton seems bigger than you think as we travel nearer and nearer to our destination. There are plenty of disused carriage sidings outside the station and then a signal box appears, before we glide slowly into the four-platform station. Seagulls give it an air of an old-fashioned seaside terminus, but most of the passengers I suspect are commuters going to Colchester, Ipswich or London. There are a lot of students waiting to get on the train and all four platforms have trains waiting in them. Outside the station looks impressive in the busy streets. I doubt whether many seaside specials come here as they once did in the 60's and 70's, but this line looks busy enough on a warm spring day.